Ineffective communication occurs when we challenge (or label) a person and not their behaviour. In so many areas of communication, and particularly in dispute situations, there is a focusing on what someone is perceived to be rather than the behaviour they exhibit. John is lazy. Dave is a racist. Sharon is sexist. Charles is ageist. Peter is lovely. Gina is wonderful. Barry’s a peach. So what did any of these people actually do to gain these labels? We don’t know. We’ve not really gained a lot of information about them other than a subjective view of the person from another person’s point of view. Sometimes it really doesn’t matter: "Gina is wonderful"…. "Oh, ok". But "Dave is a racist", "Sharon is sexist" – both of these labels will usually have arisen out of some form of destructive response to conflict. Again, they communicate nothing to assist us in understanding why such terms have been assigned to Dave and Sharon but it immediately begins to sound as though they have been marginalised and so the level of communication with them is likely to be low. Labels such as "Dave is a racist" are used often as a response in a conflict as if ‘they’ are over there and ‘we’ (the non-racists) are over here. I question the hypocrisy in this. We are all racist, sexist, ignorant, ageist, lazy, wonderful, lovely, egotistical, arrogant, as well as an infinite number of other descriptions at different moments in our lives, and to a greater or lesser degree than others at different times. I’ve seen political ‘activists’ use labels such as ‘fascist’ while their own inability to accept other viewpoints is not recognised or challenged. I’ve seen people who passionately oppose racism express views which are sexist in the extreme and those who oppose sexism express gross generalizations about others of a different race. Loving What Is: How Four Questions Can Change Your Life by Byron Katie. When you point a finger at someone else, always remember that there are three pointing back at you. When I was a teacher, there was a rapid challenge by many colleagues of a child who used racist terms towards another child, but the use of homophobic, or ageist or sizeist or other stereotyping terms went unchallenged, and I’m sure that was true of me as well. When we all understand and acknowledge what prejudice and discrimination are in all their forms, then perhaps we can identify those who haven’t quite reached that level of understanding, single them out and challenge them. But I’ve yet to meet someone who has achieved that, and I don’t think I ever will. There is a uselessness about challenging the person and not the behaviour when something they have done upsets us. It doesn’t move anything forward. It might in the short term enable us to vent our anger (albeit destructively), but it doesn’t do much to resolve the dispute because it doesn’t communicate what the behaviour was that upset us in the first place. It is a reaction rather than a move towards resolution. The impact on the person being challenged will usually lead them to defend themselves against it. Unless they are able to see that the label must have arisen because of something they have done and they enquire what it is, but this is rare. Often it causes a counter reaction to the initial reaction and the destructive responses continue to escalate. This is one of the main reasons that disputes remain unresolved. Communication about the behaviour that caused upset never occurs as the dispute becomes a tennis match of labels, none of which challenge what happened even if the dispute began with both parties knowing what happened. Once the labels start to stick, impasse occurs. This Principle is very much rooted in the Underlying Philosophy of Mediation that promotes a No-blame approach to conflict resolution. If a parent has a child who does not tidy or clean their room, they may say to them "Tom, you lazy so and so, your bedroom's a bloody mess!" This challenges the person and not the behaviour and communicates nothing about what it is that led to the child being labeled lazy. Depending on the power relationship with the parent, the child might simply not reply but become ‘moody’ or they may reply with "And you’re just moany" if they feel able to respond and have learned the endless game of challenging the person and not the behaviour. Sometimes they will say that they are not lazy and their messy floor is because they’ve been spending so much time revising, or are upset about a recent broken relationship or friendship. If they do discuss their behaviour and don't just reply with a personal label, they become our teachers of how to communicate effectively. The parent could instead say "Tom, can you pick up the plates from your bedroom floor, I almost stepped on one when I was making your bed earlier?" This avoids the need for any label of condemnation but identifies the behaviour that needs to be challenged. It may be that this has been done and the child does not respond, but even if this is so, challenging the person by labeling them lazy is never going to succeed in communicating what it is that is causing the parent to become angry. A great book on this topic is How to Talk So Kids Will Listen and Listen So Kids Will Talk which gives lots of great examples of constructive ways of talking to.... well anyone actually, not just kids. In time, if it continues - which it does if no other way is recognised - the child learns to harden to these labels as a defence mechanism, much like callouses form on continuously worn skin, and an inevitable distancing occurs in the relationship between the parent and the child. That is to say, Effective Communication is gradually eroded as the child is unlikely to want to put themselves in a position that means they are challenged and not their behaviour and so they are unlikely to want to communicate at all. Alternatively, if they are ‘feisty’ they may respond in kind and call their parents various labels. Are we able to show them by example a different way of responding? Of course, this doesn't just happen between parents and children. It happens between us all. Challenging the person and not the behaviour is ineffective communication because it can induce defensiveness in the person being labeled and does not communicate what the behaviour was that has upset the speaker. Challenging the behaviour and not the person allows for a shared review of the behaviour that caused upset or concern, and there is less likelihood of defensiveness in the person whose behaviour is challenged as they have not been assigned a negative label. 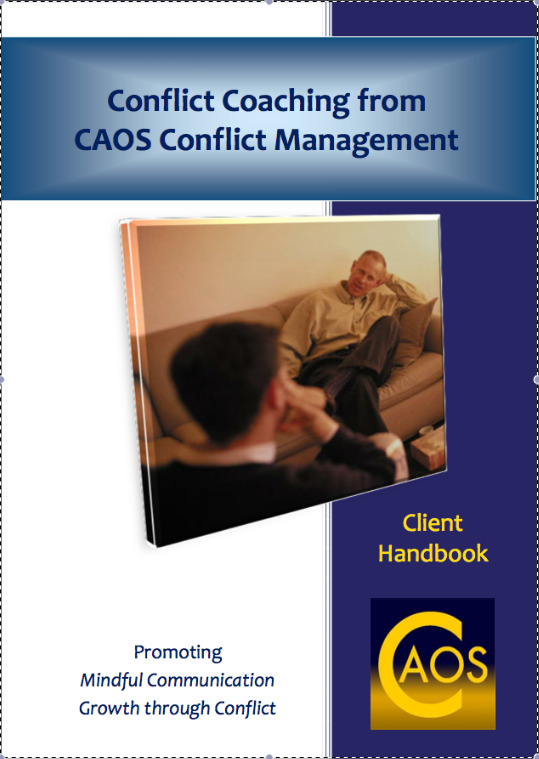 The Guide to the Principles of Effective Communication and Conflict Resolution. Buy The Guide for just $7 and get a FREE COPY of Listening, Summarising and Questioning - The Simple, Effective Skills of Conflict Resolution. Another perspective on this Principle not being practiced is to see that when we challenge a person and not their behaviour and give them a label, we no longer see them as an individual but as a concept …….. Muslim terrorist, racist, fascist, scrounger, typical single mum, yob, hoodie, neighbour from hell etc. and this enables us to demonise them and place them in a ‘box’ that we never allow them nor anyone like them to get out of. This makes us even more fearful of them as we see them as only acting and thinking in a certain way defined by the label we have given them. From that point on our imagination can run away with us as we can ascribe all manner of characteristics and motivations to them (we speak for them) and feel absolute in our belief that they are accurate, without any recognition that we need to check out the accuracy of these with the people being labeled (allow them to speak for themselves). In this way, communication is inhibited again as we see no need to actually engage with the person being challenged or labeled. Our assumptions tell us all we think we need to know. Eckhart Tolle, a Spiritual teacher, has said that, in the extreme, allocating labels to people enables us to dehumanise them and instead we attack the concept they represent to us. This attack can often mean killing those people. At the time we are killing an idea, perhaps only later realising that we have killed another human being. Every 2 or 3 weeks we hear about serious fighting between British troops and 'The Taliban' in Afghanistan. If British troops die we will see the names of 4 or 5 or however many are killed, printed in the papers. There is usually a photo, and sometimes a comment or article about those who have died. But we also hear that 'About 150 Taliban were killed in the fighting'. No names, no photos, no comment on who they were as friends, husbands, soldiers, human beings. And yet hundreds are killed, all fitting within the concept 'Taliban'. There wouldn't be enough pages left in the paper for the other articles if they were all named, with photos, with commentaries. Wasn't the justification for fighting them that they were murderous, and cruel, and intimidating and other similar descriptions? What is their justification for fighting British soldiers? Wouldn't it be the same? Both sides 'conceptualising' the other in order to dehumanise them, in order to kill them without the sense of their being human. I'm not condemning anyone, I'm just wanting to identify how conflict is escalated, unconsciously, and how, when we challenge the person and not the behaviour, when we label them, when we make them into a 'concept', we miss their humanity. And find it much easier to kill them. In essence, whether we are actually killing someone or not, we are killing the awareness of the person as a human being, when we challenge or label the person and not their behaviour. This then enables the destructive responses to a conflict to continue and to escalate. When we challenge the behaviour and not the person it enables us to keep that person alive in our experience of them, as a constantly changing, living human being. That in turn, allows for empathy, it allows for an understanding that any problem lies in 'what happened' and not 'who did it', and it allows for resolution and forgiveness, not condemnation and revenge.